The ‘Take ‘Em Down Nola’ group, which has aligned itself with the Black Lives Matter movement, is now saying publicly they plan to tear down New Orleans’ most iconic monument in the city. 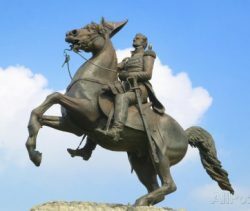 During a protest outside of New Orleans City Hall, a group of Take ‘Em Down Nola, which has made threats against the New Orleans Police Department (NOPD) and Mayor Mitch Landrieu’s administration in the past, said police will have to step aside this weekend as they plan to physically tear down the equestrian Andrew Jackson monument in the French Quarter. “So you plan on tearing down the Andrew Jackson monument?” one reporter asked the spokesman of Take ‘Em Down Nola.